Think Without Limits - You Can Speak Welsh! Thousands of people each year set out to learn Welsh - through evening classes, week-long courses, WLPAN and other sessions. But a large proportion drop out. The author tackles this problem in a way no-one has done before. She examines situations where learners have found it difficult to use their Welsh. Lynda Pritchard-Newcombe herself learned Welsh as an adult, and writes with gentle humour of the pitfalls she faced while beginning to use the language outside the classroom. She now teaches Welsh to adults in Cardiff, and with the Open University, and has been involved in several research projects on bilingualism. • If you are a learner yourself, there are tips to help you to be braver with your attempts to use your new language. • If you teach Welsh, Lynda has tips for you, too, on how to equip your students to use Welsh outside the classroom. 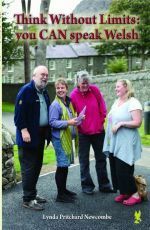 • If you are a first-language Welsh-speakers, maybe you feel you don’t know how best to help learners – this book will help you!